Powers/Abilities: He possessed peak human Strength and could teleport. He also had some sort of sixth sense that allowed him to predict adversaries' moves. (Alpha Flight I#121 - BTS) - Some time later, the Brass Bishop met Dr. Hedison, a scientist. The Bishop learnt that part of the huge energy released from the death of the Sphinx at the Terminal Technology complex was stored in Silver and Auric's corpses and then was, in part, transferred into Hedison's body. The Bishop had the idea to sell this power, ready to be transferred again in the body of another subject. He had the Chess Set kidnap Hedison and steal the corpses of Silver and Auric. He also built a device to transfer the power stored in Auric, Silver and Hedison into a fourth body. Then he organized an auction spreading the news in the criminal world. (Alpha Flight I#121) - Gathered in a hangar of an abandoned airstrip, lots of criminals attended the auction. Meanwhile Alpha Flight and Spider-Man had found the meeting location and interrupted the auction just in time. The Bishop ordered the Chess Set not to intervene in the battle between the heroes and the attending villains; they had to defend the Nexus of the power-transfer device. But Nemesis managed to assault the Chess Set from behind. 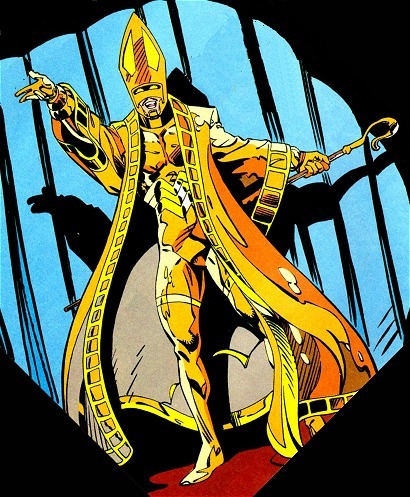 Spider-Man tried to help Nemesis but the Brass Bishop anticipated his move and teleported himself in front of Spider-Man. In spite of the Arachnid's quick reflexes he anticipated his jump and grabbed Spider-Man's leg and smashed the hero against the wall. Meanwhile Nemesis destroyed the Nexus. The resulting explosion merged Auric, Silver and Hedison into an incredibly powerful new entity. The new being grabbed the Brass Bishop and the other members of the Chess Set in huge hands made of energy to get his revenge. Guardian begged the entity and convinced him to spare the Chess Set's lives. Nemesis also wanted to avenge Auric and Silver and was seriously pointing her sword to the Brass Bishop's gut but Wildheart stopped her. 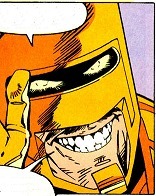 His first name was revealed in Mysterio (Beck)'s profile in OHotMU A-Z Hardcover#8. or any other character with a similar name..